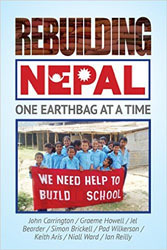 Rebuilding Nepal, One Earthbag at a Time is a short Kindle book assembled by a team of eight volunteers who went to Palchok in the Trishuli Valley to rebuild a school in the fall of 2015. Because of the remote location they needed to plan for every aspect of the project, and this book is primarily advice for others who might try to do something similar. Besides actually building the school, they wanted to introduce the earthbag technique to the villagers so they could continue rebuilding this way. The team had raised enough funds from friends and family to accomplish this goal. They were there for only two weeks, but they got that small school built! Graeme Howell was the mastermind behind this endeavor. The first chapter introduces what they consider to be the essential building process and suggests how to make this happen efficiently. Because of the number of volunteers, including folks from the village, they wanted to keep everybody busy and make sure there weren’t bottlenecks in the process. For this reason they had people filling and sewing bags right away, even before the foundation trench was prepared. Likewise, they had people screening soil for the eventual plaster. Some of what is described in the book contradicts what I know about earthbag building. For instance they claim that the best ratio of soil for filling the bags is 50% clay, 40% sand and 10% water. This is considerably more clay than I have ever seen advised for earthbags, or even for plaster. Of course local conditions vary, so this may have been the case with their particular soil. They also claim that all soil should be screened rather finely to exclude virtually all stones. I think that this is generally unnecessary and adds a great deal of extra work. They carefully measured the amount of soil that went into each bag, so that they were all uniformly filled. They say that the foundation should be one or two bags deep, but there is no suggestion that there may need to be a rubble trench beneath that, or that the first few courses of bags should be filled with only gravel. They do emphasize the need to accurately line out the perimeter of the building and to be aware of drainage around the building. As far as building the wall goes, they say how important it is to tamp it. They used one strand of barbed wire between bags, and every six or eight courses they periodically pounded one meter long rebar stakes through the earthbags. Steel door and window frames were used, and these were resting on wooden planks, which in turn were laid upon chicken wire mesh that was looped over any lower bags. Several courses below the top of the wall “rebar staples” are inserted to which the roof gets attached. There is no mention of a bond beam. The roof was plastic corrugated sheets connected to prefabricated triangular shapes that were “welded” to the staples. Before the roof was attached, they looped chicken wire mesh up and over both side of the wall to reinforce the plaster. The plaster itself consisted of 8 parts dirt/clay : 4 parts sand/grit : and 3 parts of cement. This was applied in two stages, with the final coat being painted. To reinforce the fundraising they kept people back home appraised of the progress of the project. They had a contact team member in the nearest city who could keep up with this communication, as well as coordinate any emergency or health related issues and help procure more materials as needed. They had a satellite phone that could be used to communicate with this liaison, since cell phone reception was dubious. In terms of the organization of the team itself, there needs to be one team manager who ultimately makes all team decisions. Each team member needs to know what he or she is responsible to do. Regular, preferably daily, meetings need to occur so that all can communicate needs and observations. It is best if some of the team have prior experience to bring to the project, for instance carpentry or roofing. They organized teams for digging and screening the earth, filling and sewing bags, cutting barbed wire and staples. A separate medical team was assembled, which not only administered to the needs of the workers, but many local villagers sought their attention. Included is a long list of medical supplies. A “troubleshooter” was assigned to watch all of the aspects of the building process, and he could intervene as needed to keep everything moving smoothly. A supply manager made sure that all necessary supplies were at hand when needed. There is a long list of all the materials needed for this particular project. The team effort that went into this project demonstrates how grass-roots projects can often get done where larger NGO’s may fail.